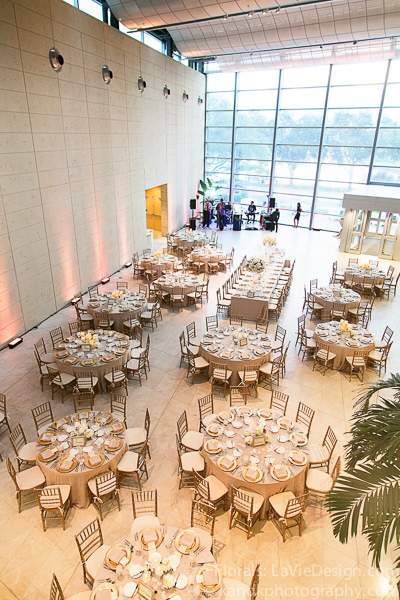 Michelle and Forrest held their wedding ceremony and reception at the St. Petersburg Museum of Fine Arts , in St. Petersburg, Florida. Ivory was the dominant theme for this couple’s nuptuals, and with a colorful ending they went out with a bang! 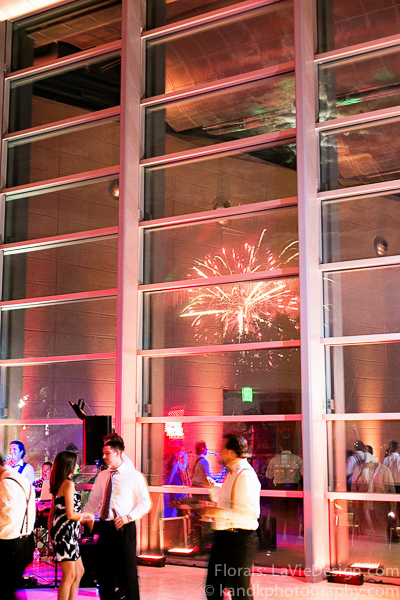 Fireworks over the bay had all the guests cheering and celebrating this perfect union! 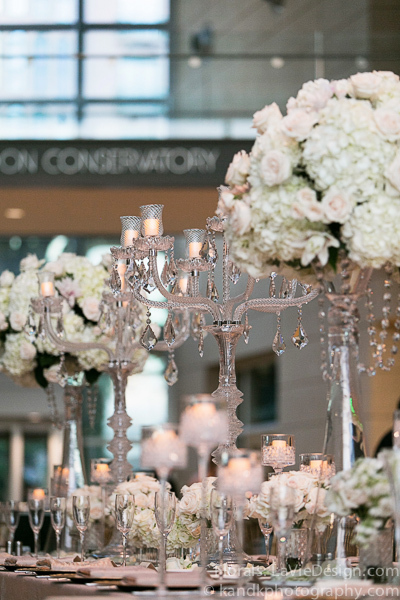 La Vie en Rose provided all florals, centerpieces, candelabras, and mercury vases. 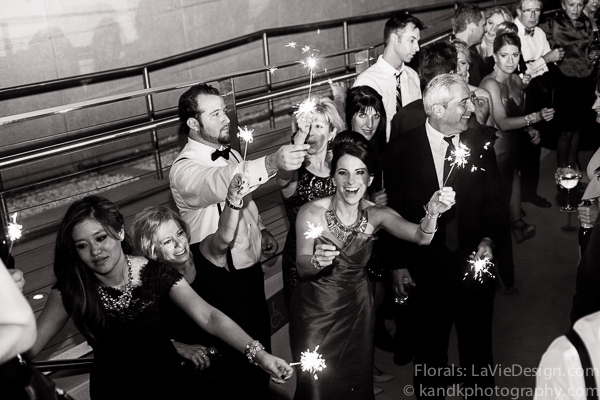 Thanks KandK Photography for the images! 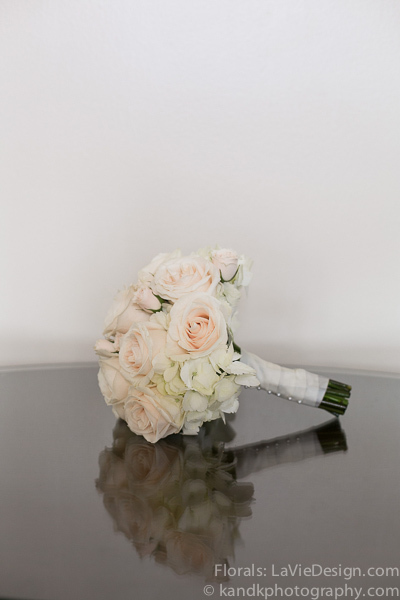 Ivory roses and hydrangea made up the bridesmaids’ bouquets. 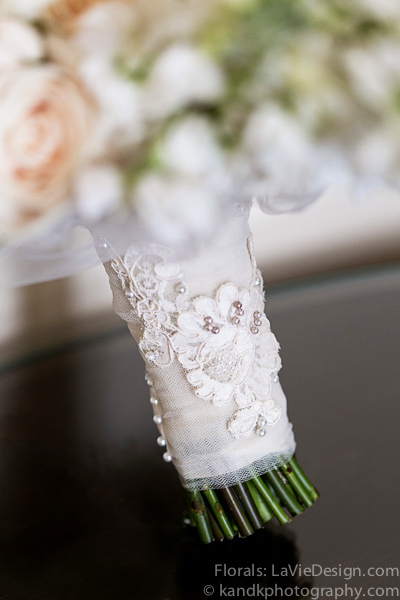 Michelle requested that we tie her bridal bouquet with a trimming from her grandmother’s wedding dress. This was a unique and sentimental touch that took care of the “something old” from that classic bridal adage. 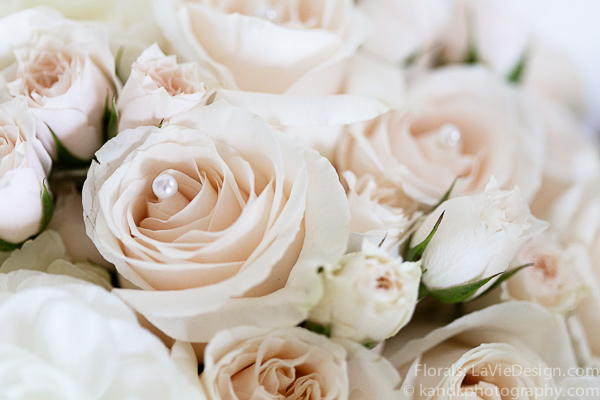 Michelle’s bridal bouquet was finished with a touch of pearl on each of the large rose heads. 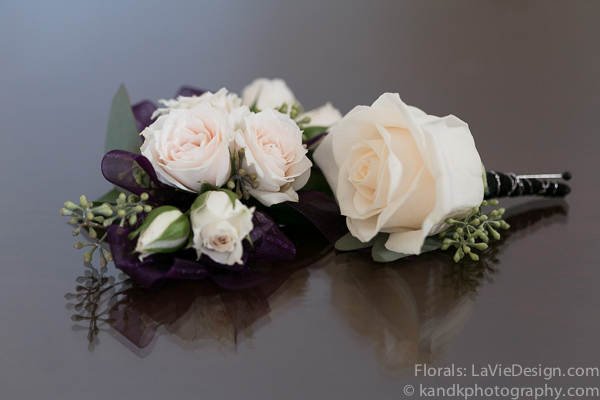 The corsage and boutonniere design was simple, but stood out with the seeded eucalyptus sprigs and colored, sheer ribbon. 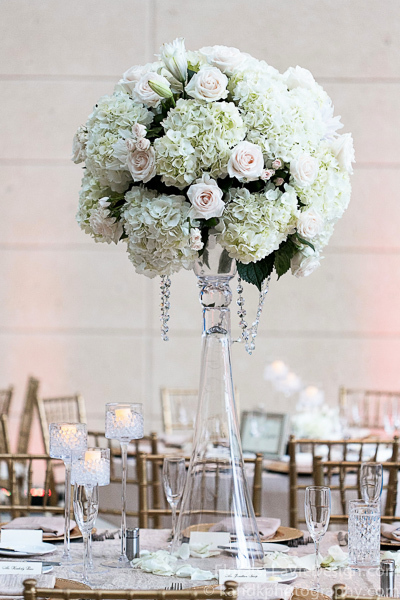 Tall hydrangea and rose centerpieces were decked with strands of Swarovski crystals, with just one or two casablanca lilies for a more organic feel. 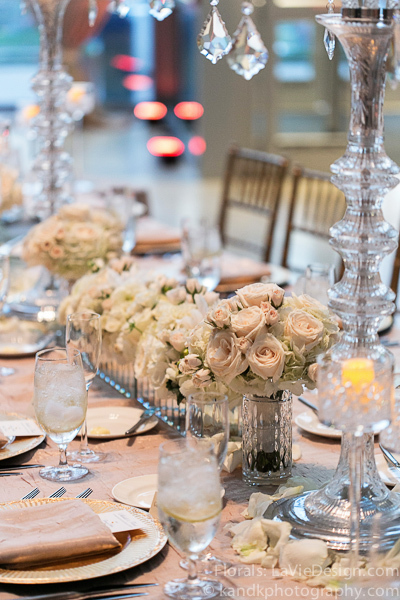 Hydrangea arranged in mercury vases were lit up by the tall stemware containing aqua beads and votive candles. What a great idea! 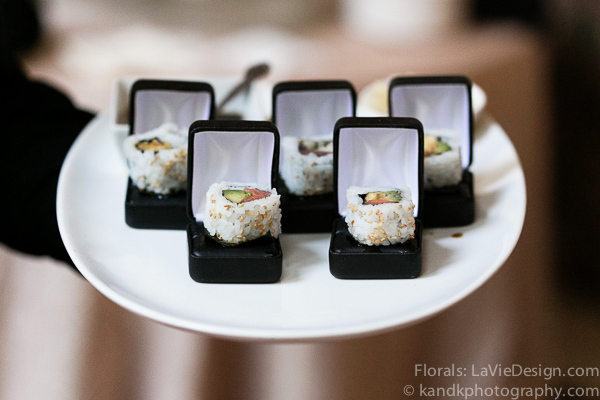 Even the sushi was displayed with decadence! 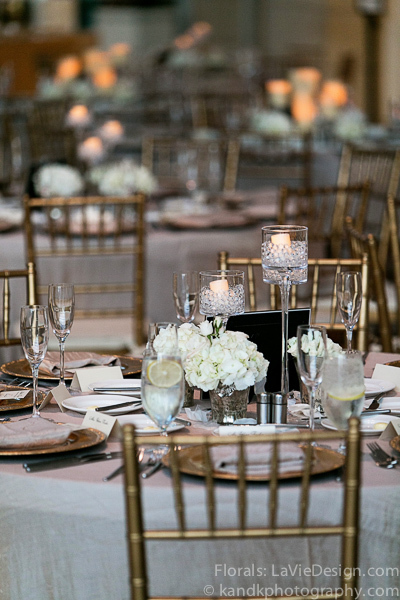 Candelabras with votives for the wedding party table are a fantastic way to express appreciation for the special people chosen to sit with the bride and groom. 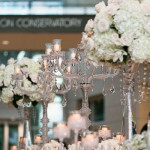 These candelabras are also draped with Swarovski crystals! 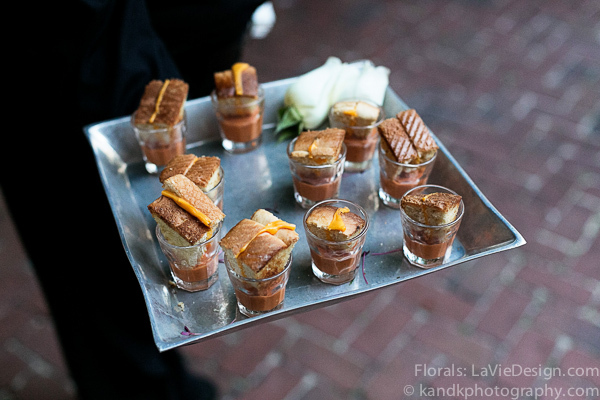 Again, we just can’t get over the unique way this bride and groom chose to serve hors d’oeuvres! 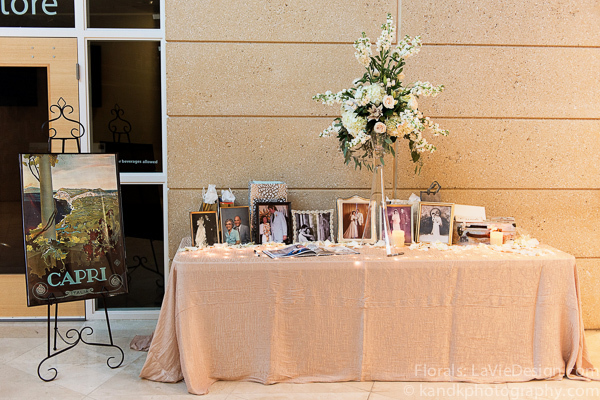 The card table was also used as a celebration piece, with photos of their parents and grandparents at the altar! 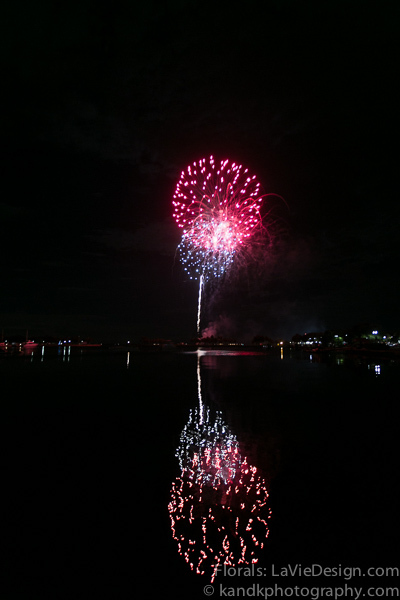 The Tampa bay is gorgeous at night – especially when lit with fireworks!